This week China made it four games without defeat with their 1-1 draw with Palestine. It was again not the most inspiring of matches but they at least avoided defeat and are starting to make themselves hard to beat. 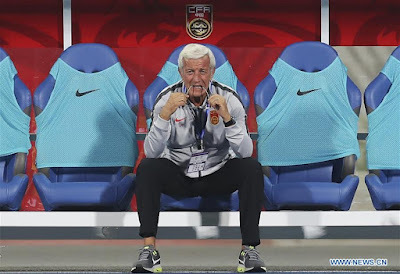 Marcello Lippi who is set to be away after the Asian Cup looks like he is starting to use some of his Italian defence skills after some heavy defeats. China's recent results have seen an upturn in fortunes after heavey defeats to Colombia, Wales and the Czech Republic in the last year. Although a win over Syria and draws with India and Palestine and not exactly breathtaking after leaking goals for fun, the defensive frailties seem to be improving. Then with Yan Junling in goals, they seem to have a safe pair of hands. Going into the Asian Cup the goalkeeper will be full of confidence after winning the League title with Shanghai SIPG. Meanwhile, the 27-year-old as only conceded two goals in seven matches. This will be a great relief to the player having lost ten goals in two games at the China Cup. Despite it not being all doom and gloom a lot still needs to develop with this China side and fast if they are to make an impact at the Asian Cup in less than 50 days. As drawing with an improving Palestine side is not all bad a country of over a billion people with a national league that attracts such interest should be aiming higher. The issue seems to be that Lippi is now focusing on defending to keep his teams tight but this as meant they do not offer enough of an attacking threat. This was only too clear in the draw with Palestine this week. As it was seen after going ahead early through a Feng Xiaoting header the Chinese side sat back and allowed the pressure on themselves in Hainan. This eventually toppled when Alexis Norambuena found space for the awayside inside the box and was able to get his shot away and equalise. After going behind they were not then able to push forward also which will be a disappointment to fans of China. Lippi then who as won a World Cup looks set to have to pull off a miracle to retire on a high at the Asian Cup.